Here is the latest of my photography tips – showing part of the scene. Sometimes it is more effective to show only part of the scene to communicate emotion in an image. This week I have been in Sydney. If you have never been to Sydney, it is worth the trip just to spend a few hours walking around Sydney Harbor. In less than one hour you can visit Darling Harbor, The Rocks, Sydney Harbor Bridge, Circular Quay, Sydney Opera House, and the Botanic Gardens. While you can do that in less than an hour – I recommend taking the camera and spending much longer. Visiting Sydney reminded me of two of my favorite images – both taken several years ago, and both of which provide a compelling image by showing part of the scene. The image above was shot at dawn. 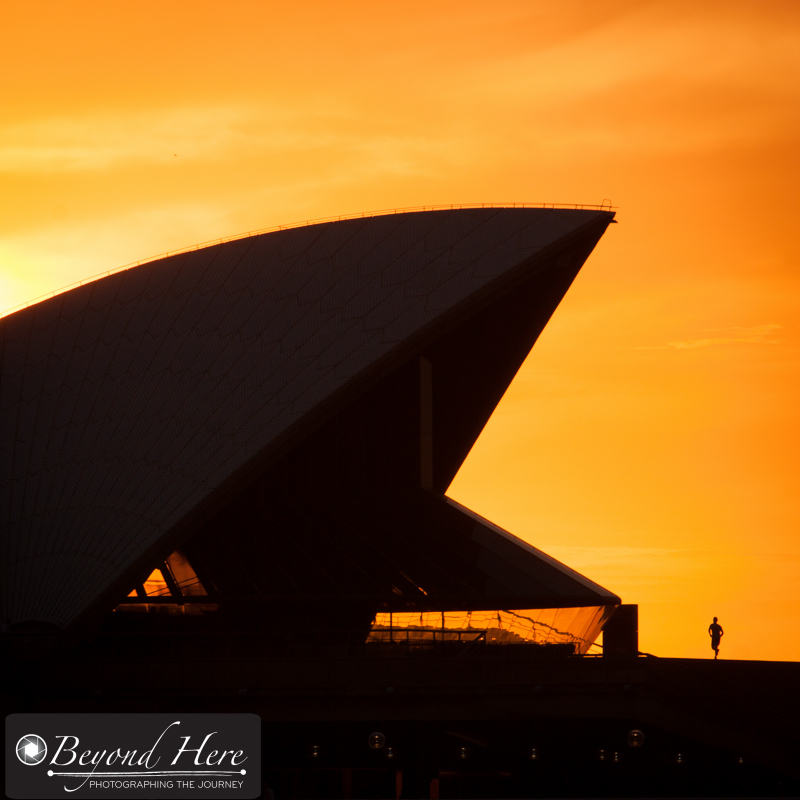 I was standing opposite the Opera House using a 70-200mm lens. It was a grey cloudy morning, until the sky lit up in golden, yellow colors. The sun broke through the cloud for no more than 3 or 4 minutes. During that time, I was fortunate that a jogger ran up the steps and into this scene – highlighting just how big the sails are. The second image (below) was shot at sunset. It is a closeup of people doing the Harbor Bridge climb. It was taken from in front of the Opera House looking across to the Harbor Bridge with a 70-200mm lens. Again, shooting only part of this scene gives a stark contrast between the huge metal bridge structure and the tiny human figures. The nice sunset helps as well! Both of these images are good examples of showing only part of the scene to communicate a message. The contrast between the small human figures and the large architectural structures is really striking. These images were both shot in the Sydney Harbor area. Do you have a favorite photo spot in Sydney? 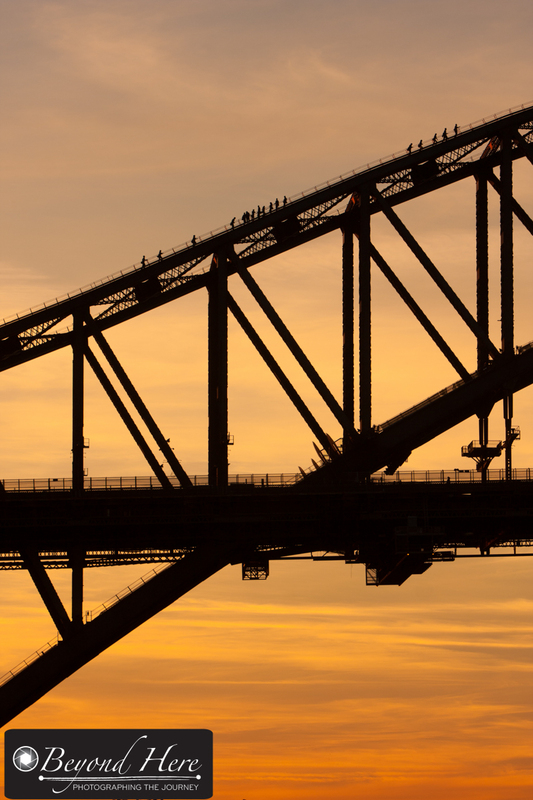 This entry was posted in Photography Tips and tagged architecture, australia, back lit, dawn, dusk, silhouette, sunrise, sunset, sydney, sydney harbor, sydney harbor bridge, sydney opera house, twilight on June 21, 2014 by Craig Dingle.